KAILUA-KONA, Hawaiʻi - Researchers with the University of Hawaiʻi - Mānoa are gaining a better understanding of the Hualālai aquifer using marine electric-field receivers. 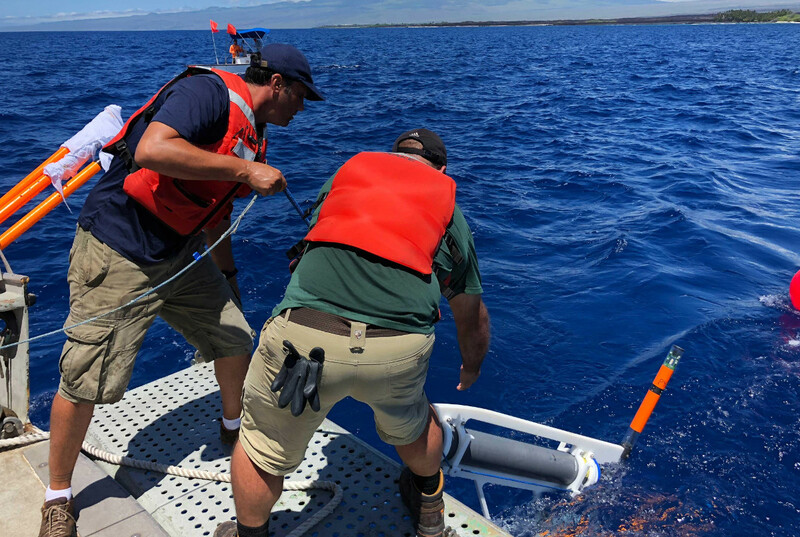 (BIVN) – A nine-person research team from the University of Hawaʻi is trying to gain a better understanding of how freshwater from Kona’s Hualālai aquifer releases into the ocean, below the seafloor. According to the Hawaiʻi County Department of Water Supply, the Hualālai Aquifer Sector Area is divided into the Kiholo and Keahou Aquifer System Areas, the latter of which was recently the focus of a National Park Service petition to designate it as a Groundwater Management Area. The petition was denied by the State Commission on Water Resource Management. Parrotfish, Pike, Pompano and Perch were instrumental in helping University of Hawaiʻi at Mānoa researchers gain a better understanding of Hualālai aquifer on Hawaiʻi Island. The four marine electric-field receivers, dubbed with common fish names, are part of state-of-the-art technology used by researchers from ʻIke Wai, a large-scale, multidisciplinary project funded by the National Science Foundation’s Established Program to Stimulate Competitive Research (EPSCoR).